Charlotte is at risk of real canopy loss. Charlotte’s tree canopy is at risk. Large, mature trees lining the streets of Charlotte are reaching the end of their lifespan, while development results in removal of large quantities of trees everyday. The question is: What will Charlotte’s canopy look like in 2050? 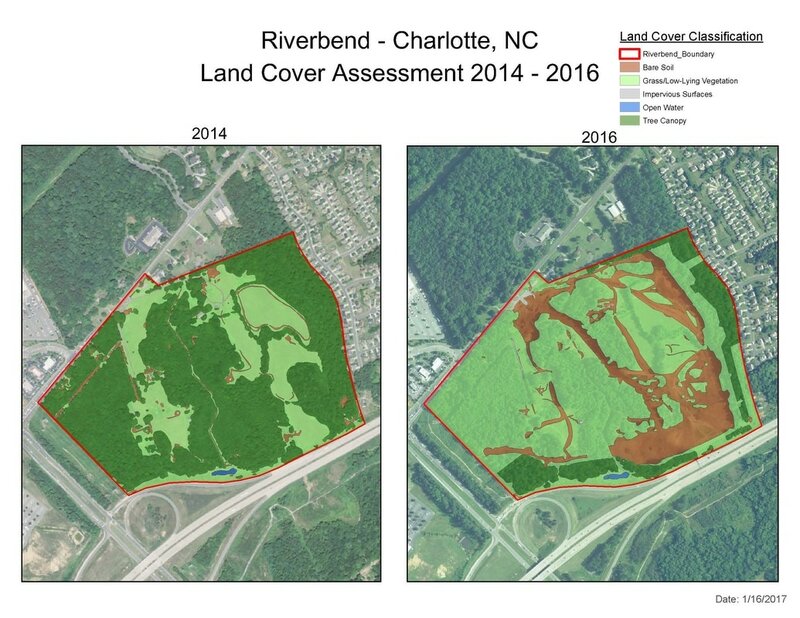 Forecasting the future of Charlotte's tree canopy is difficult due to the number of variables that affect canopy loss. However, assessing the estimated impact of some of those variables can be productive with respect to identifying areas of improvement and mitigating future loss. Three canopy forecasting models were utilized to predict future canopy in terms of impact of 1) aging canopy and 2) development in Charlotte. The first model found that aging canopy in older neighborhoods could lose close to 60% of the street trees in the coming years. The second model shows the impact of construction in three new developments in Charlotte. In the third model, we can estimate future canopy based on future land use together with current tree canopy percentages. While no model can incorporate all factors, the bottom line is that we see a drop in canopy across all three models. The in the first model both neighborhoods lost about 60% of their street trees as mature trees died. In the second model it was found that even after 30 years of growth post development 10%-55% tree canopy was lost. The last model predicts a 7% or 11,400 acre decrease in canopy cover. Loss of canopy has real impact on the health and vitality of a community. If we look at the change in benefits provided by tree canopy from today's coverage (47%) to a future hypothetical coverage of 35%, we see real loss in benefits. If we examine and compare tree benefits at a 35% canopy cover versus today's tree canopy of 47%, serious drops in essential services become evident including declining air and water quality, higher energy bills, lower public health, and more. 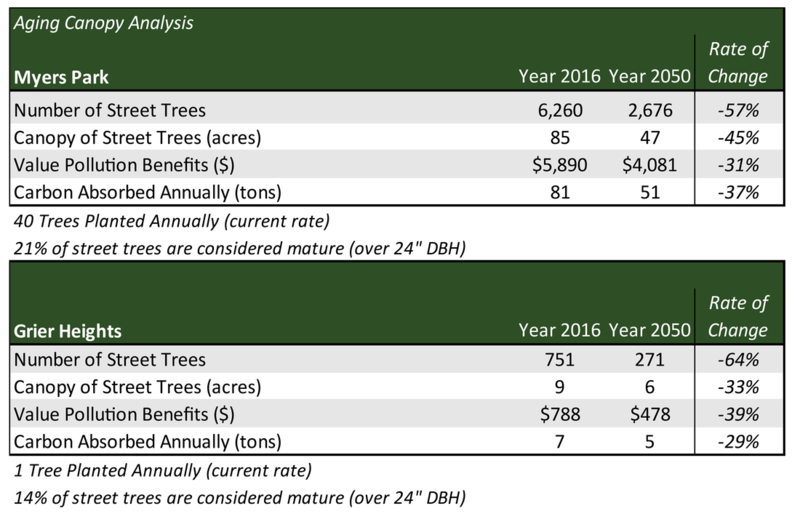 Benefits changes comparing the current 47% canopy to a future 35% canopy are shown in the table below. ​Data Source: i-Tree Canopy, i-Tree Hydro models and Charlotte canopy. In one model, the impact of aging tree canopy in older neighborhoods was examined by forecasting the future population of street trees in two neighborhoods with older tree canopy: Myers Park and Grier Heights. The model used i-Tree Eco modeling software to incorporate annual growth and natural mortality for trees of all conditions and ages, while factoring in annual planting efforts. Read more about this methodology here. This projection model found that aging canopy in older neighborhoods may result in a loss of 60% of street trees and result in 40% decrease in overall tree canopy, as shown in the tables at right. Note that while the City of Charlotte strives to replace a tree once it is removed, this is dependent on available resources. For this reason, and to isolate the aging canopy impact alone, this particular model excludes replacement planting. However, it can be inferred that if every tree that is removed is replaced, these losses will be less severe, though a mature tree can have a canopy that spans an entire acre. For this reason, replacement plantings won't make up for lost tree canopy in the short term. Tree replacement should be incorporated into a policy in the city's Planting Strategy. Formalizing a management plan will extend the lives of the older canopy as well. 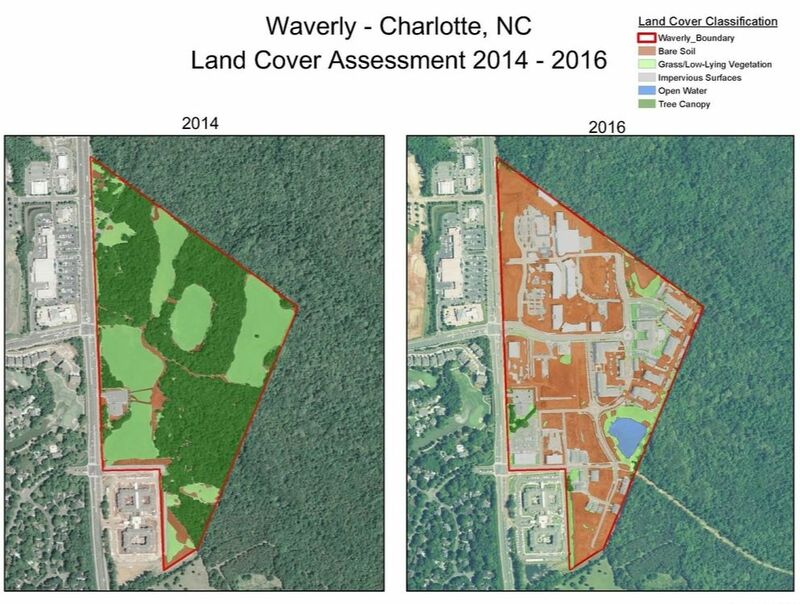 To examine the impact of development and the existing tree protection code on tree canopy overall, land cover on three development sites (Rvierbend, Rhea Farms and Waverly) were examined before and during development to track the changes in canopy. 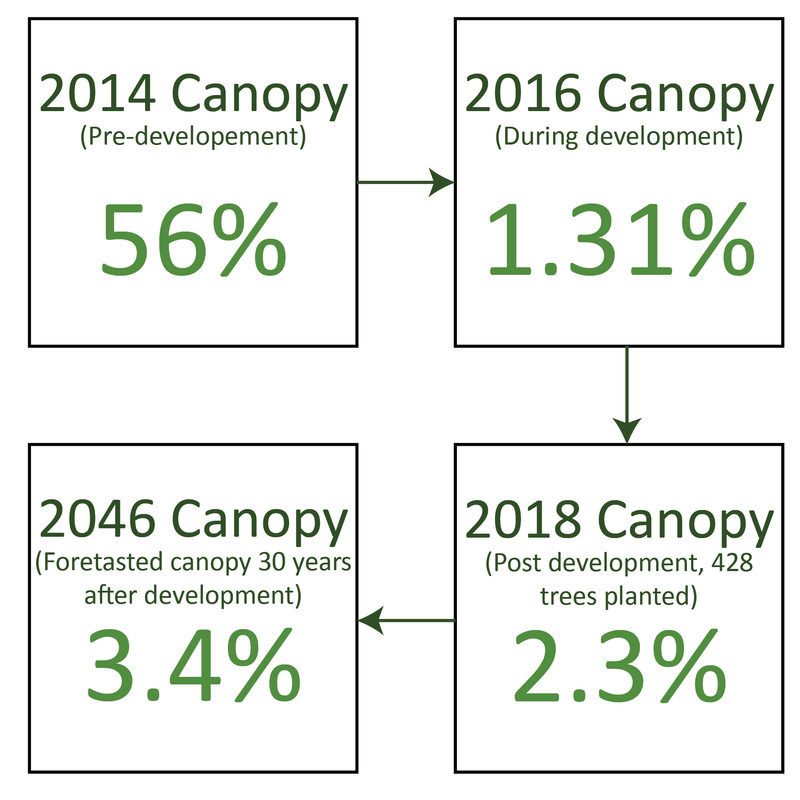 In addition, the tree plantings required by each developer was incorporated, and future canopy forecasted through i-Tree Eco's forecasting tool. This tool forecasts the future tree canopy that will be added through natural growth and mortality over the next 30 years, based on the region and species growth rates. The resulting canopy was added to the post-development canopy to provide a sense of future canopy on a development site that are under the regulation of the current tree protection code. On each site, there was between 10%-55% canopy loss. Findings for each site can be seen below, with more details on the model data and assumptions on the methodology page. Type of development: Mixed use. ​Before development, 68% of this site was covered by tree canopy. 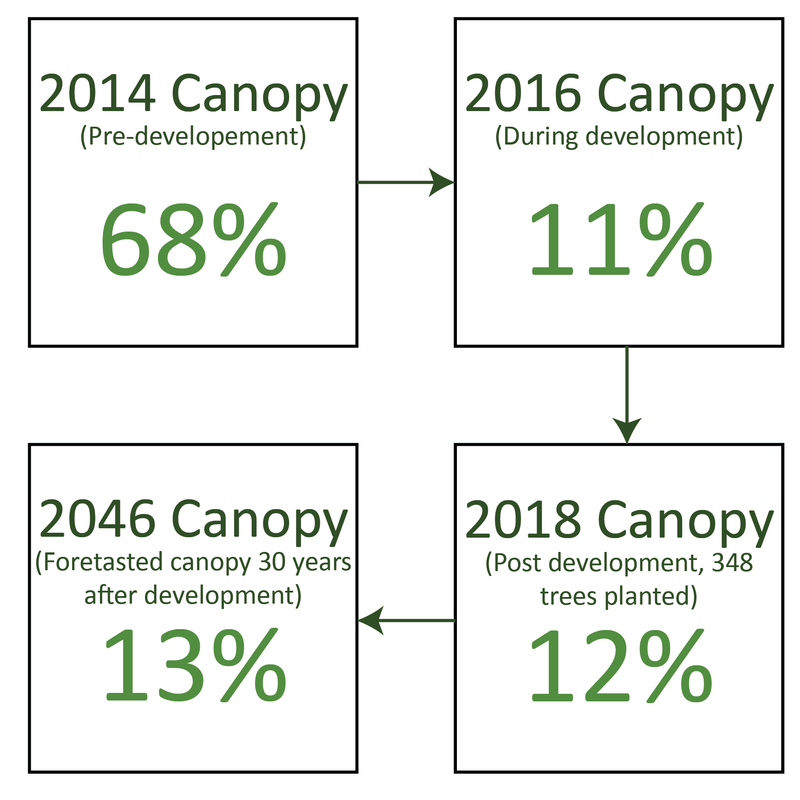 After development and required tree planting, future canopy decreases by 55%. Click to enlarge map or chart. To extend this analysis one step further different tree planting scenarios were run. While it not feasible to plant 100 trees a year at Riverbed due to lack of space or funding it is important to see the necessary amount of planting to achieve high levels of canopy. This stresses the importance of maintaining stands of mature trees on development sites when possible. Before development, 27% of this site was covered by tree canopy. 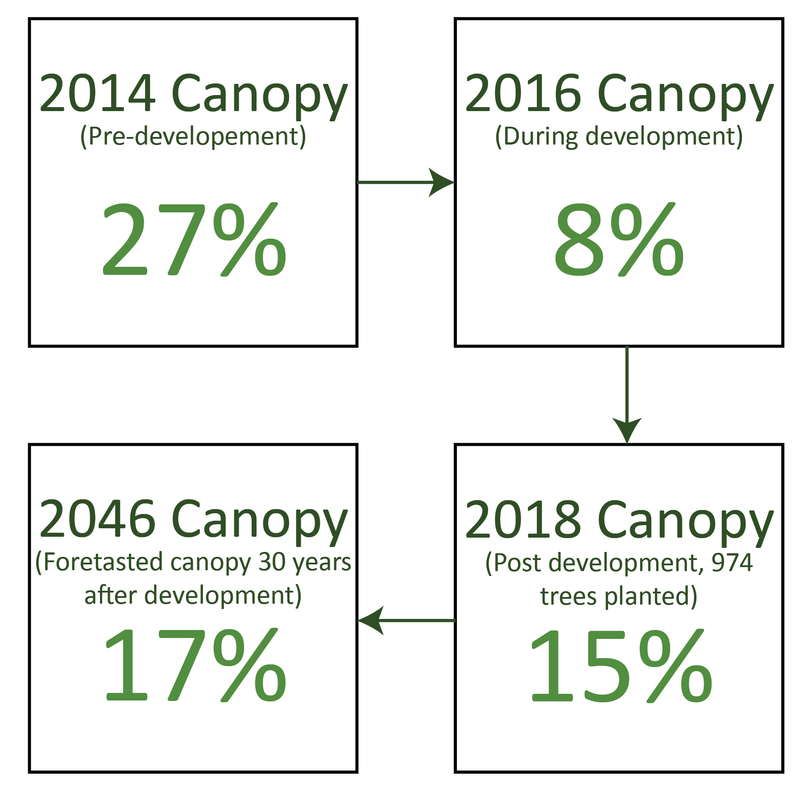 After development and required tree planting, future canopy decreases by 10%, which is about 1/3 of the canopy present before development. It should be noted that Rea Farms had previously used as a gold course, whereas other sites were mostly natural or undeveloped land. 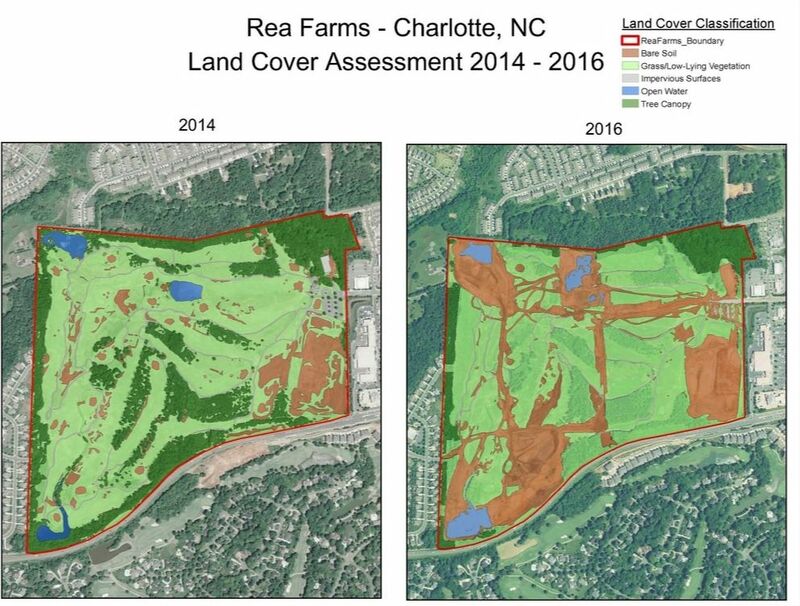 ​The residential section of Rea Farms was studied to better understand the tree canopy cover change in new residential developments. Changes in land cover types in the residential section of the Rea Farms development. Before development, 55% of this site was covered by tree canopy. 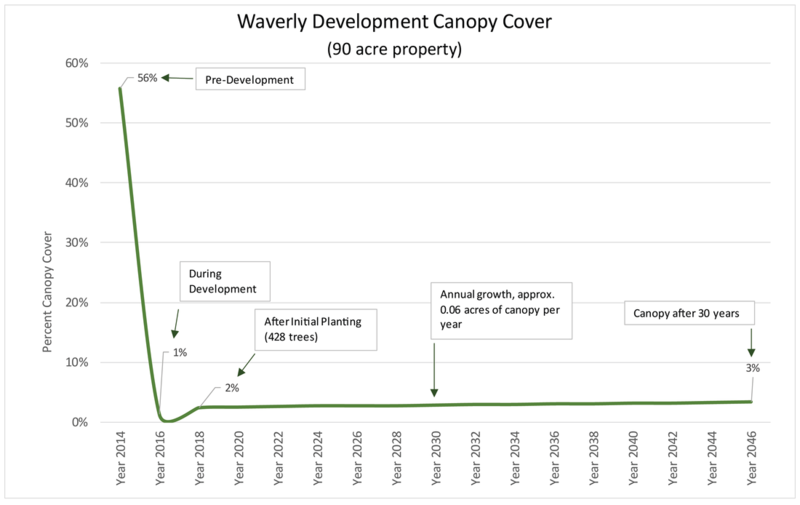 After development and required tree planting, future canopy on site decreases by 52.6%. Visit the methodology section to learn about how these forecasts were calculated. A third model strives to estimate future tree canopy by a method centered on expected land use changes. Assessing canopy cover levels by land use today (at the parcel level), and applying those rates to the city's future land use map, provides a a glimpse of potential canopy change as the city grows. Based on a theoretical build-out map in line with the city's future land use plans, future canopy could potentially drop to 41% (down from 47% today). This 6% of canopy loss translates into the removal of over 11,000 acres of trees. 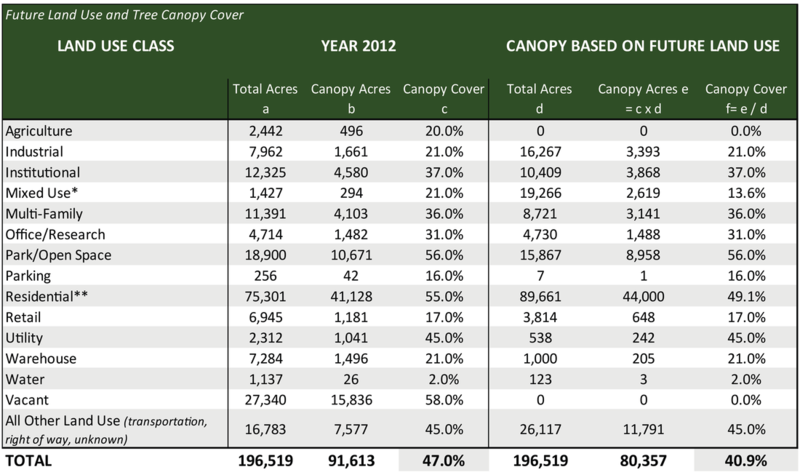 The table at right shows the anticipated changes in canopy using this model. It lists the current acreage and canopy cover for each land use type (based on the 2012 urban tree canopy assessment), along with expected acreages from the city's future land use map. Since current and future land use classes do not perfectly correlate land uses classes were grouped with similar land uses. Additionally, to see these groups please refer to the methodology section. To improve accuracy, percentages from model two were used for new mixed use and residential acres. ​The future land use map was developed by the City of Charlotte Planning Department and provided to the public through the City of Charlotte Open Data Portal. The map is the adopted future land use approved by City Council via District Plans, Area Plans, and Rezoning cases. 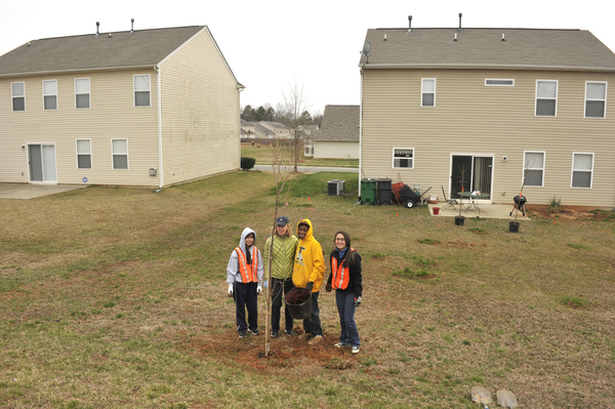 New tree planting in a new subdivision in Charlotte. * Future canopy acres were estimated using the outcomes of the subdivision analysis. 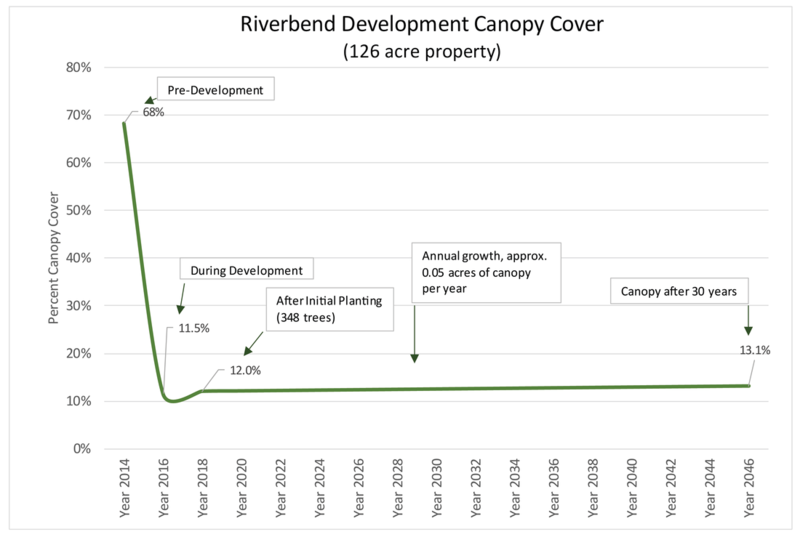 **To calculate future residential canopy all current residential acres retained a 55% canopy cover. 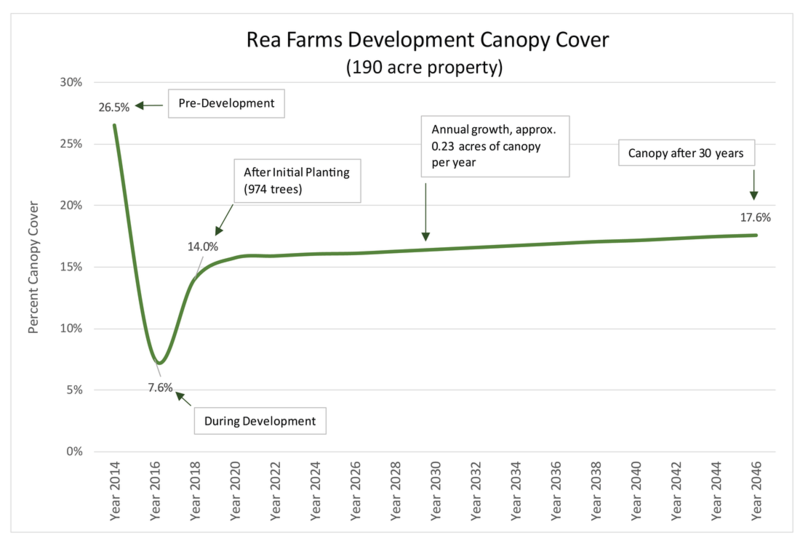 The residential portion of Rea Farms provided the tree canopy cover (17%, plus and additional 3% to account for planting and growth) for all new residential acres. ​"Large hardwood trees are exceptionally beautiful. Large mature hardwoods growing within residential and business areas reflect forward thinking city planning. Developers can be the greatest detriment to Charlotte's mature hardwood canopy. We must balance our desires to make a financial profit with an aesthetic and Eco progress conscience. " "Overall beauty and charm of this city is the trees. We are losing what made Charlotte the quaint city it is." "In general, trees help define the Queen City. I love our canopy and hate every time I see trees getting cut down or plowed through for urban sprawl and uptown projects. Charlotte is and should even more so, make its mark as a Tree City, a Green City not only for human residents but for our increasingly stressed out wildlife communities. Please, let's plant as much as we can, preserve all we can and while growth is going to continue, let's plant, plant, plant and keep as many trees and green areas as possible."